The MINDBODY® app allows you to book and pay for services directly from your smartphone. Simply store your credit card details in the app, then choose the desired payment method during checkout to complete your purchase. To start, tap on the Profile icon at the bottom of your screen. Tap the Add a card button, or Add at the top right, to enter new billing details. Tap on an existing card on file, then select Remove this card to delete it from the app. If you need to update your stored credit card number, just delete the old card and add a new one in its place. How do I add a credit card while checking out? When booking a service, you'll see your default payment method. Tap on the payment method. From there you'll be able to choose another card if you have more than one listed, add a new card, or even enter a gift card. Cards added here can be stored in the Payments section for later use. 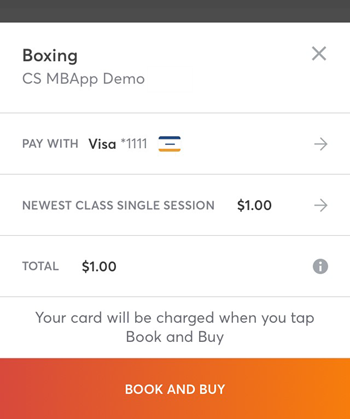 Will updating my credit card through the MINDBODY app update my credit card with other MINDBODY businesses? It will not. Your MINDBODY app account is separate from the profile used at your local studio, gym, or salon. If you need to change the credit card used to pay your monthly membership dues, you'll need to contact the business directly. How do I add a card on the web? Go to the web booker and log in to your account. Then, select your name at the top right and choose Wallet from the dropdown menu.